The Dallas Regional Chamber’s Education & Workforce team works closely with Dallas County Community College District (DCCCD) to expand the workforce pipeline in the region. In May, voters in Dallas County will have the opportunity to join us in supporting the district by approving a $1.1 billion bond program, which will improve job training with no change in the current tax rate. The seven colleges that comprise DCCCD fill a unique gap in the talent pipeline for the Dallas Region. At the DRC, we are proud to help a trailblazing institution such as DCCCD align educational experiences and training with industry needs, and in the process, help graduates attain meaningful, living-wage employment. The regional economy requires workforce development support from higher education, and DCCCD helps meet that need with quality curriculum that is relevant to and informed by industry. Dallas County has exploded in population, adding more than 166,000 new residents since 2013 (7 percent growth). 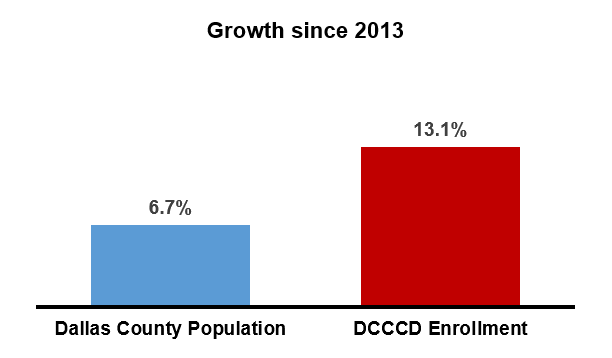 DCCCD enrollment has not only met the challenge of serving more students but has expanded access even faster, growing by 13 percent over the same period. 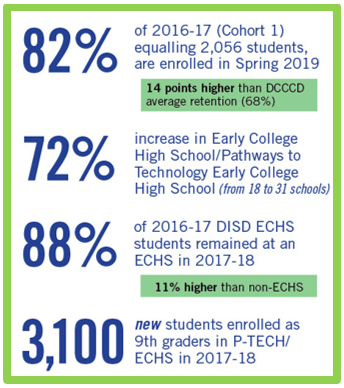 Much of this enrollment growth is attributable to the expansion of Pathways in Technology Early College High Schools (P-TECH), along with the launch of DCCCD’s innovative student access program, Dallas County Promise. Through the Dallas County Promise, participating colleges provide “last-dollar scholarships” to students who graduate from one of 43 Promise high schools. The Promise scholarship covers the gap between need-based financial aid and the cost of tuition for up to a time limit or the completion of a degree per institution. Programs such as these are instrumental in reaching the statewide goal of 60 percent credential completion by all 25-34 year olds in Texas by 2030 – a total of 3.4 million certificates or degrees, with targeted goals for Hispanic, African American, and economically disadvantaged individuals. The DRC believes it is critically important to maintain the economic momentum as we continue to expand the talent pipeline in our region for companies and their employees. To support the influx in new students and expansion of its innovative programs, DCCCD is proposing a $1.1 billion bond proposition that will result in better training and better jobs for young adults and career seekers with no change in the current tax rate. On Saturday, May 4, Dallas County citizens will have an opportunity to support a bond program that will dramatically expand higher education and career training in Dallas County, build the future workforce, and sustain the region’s economic vibrancy for decades to come. This is DCCCD’s first bond election in 15 years and only the third bond election in the district’s 53-year history. Both previous bond programs have passed with wide support and the resulting funds have been effectively managed. The DRC is proud to support Dallas County Community College District as a vital element of our regional economy and talent pipeline. We must continue to provide better training, better access, and better jobs for our entire community. DCCCD has met this challenge head-on, and we are excited about many new opportunities ahead. Join us in voting FOR this important bond issue at the bottom of your ballot in the upcoming May 4 election.